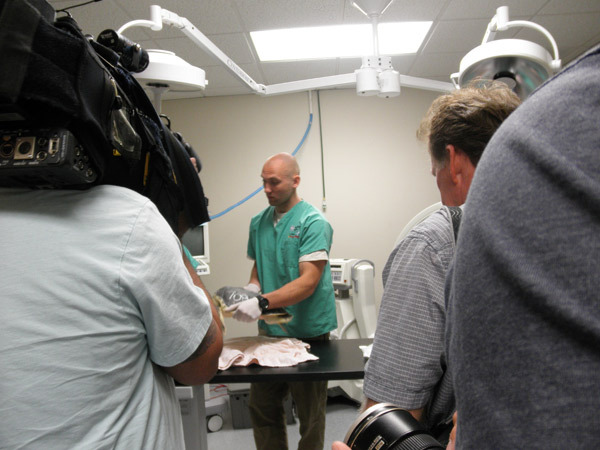 Saturn, a rescued, juvenile Kemp’s ridley sea turtle, underwent a CT scan on Wednesday June 8 in Woburn to see if his persistent case of pneumonia was successfully treated after nearly a six-month battle with the illness at the New England Aquarium. The Boston Globe covered the scan in this video and this blog post. 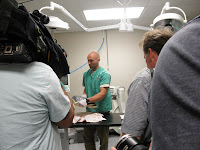 Saturn is prepared for the CT scan by New England Aquarium veterinary staff as members of the press look on. Saturn weighs 13 pounds and is estimated to be between 2 and 5 years old. He was admitted to the Aquarium last December after being stranded at the Sea Street Beach in Dennis due to hypothermia (read more about how sea turtles are rescued here). He also has had a recurring case of pneumonia ever since. 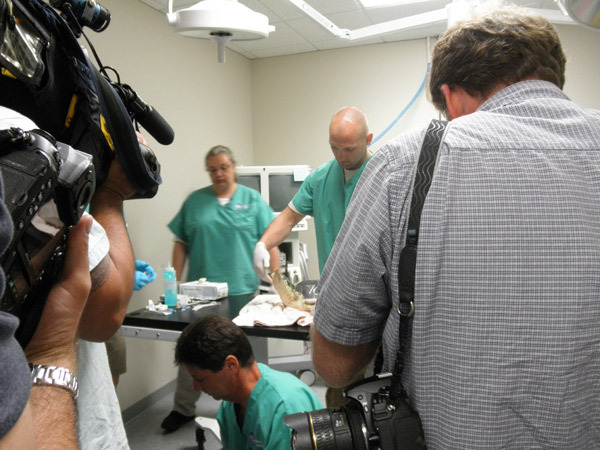 If Wednesday’s CT scan determines that his case has been successfully treated, Saturn should be released back into the wild off the coast of Massachusetts in July or August (view photos of a recent release here). 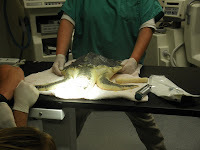 Veterinarians at the Massachusetts Veterinary Referral Hospital in Woburn have assisted the Aquarium in the care of Saturn and numerous other animals including a grey seal with scoliosis, a fur seal with congestive heart failure, two penguins for cataract surgeries, and loggerhead sea turtles and Kemp’s ridley sea turtles with pneumonia and orthopedic problems. 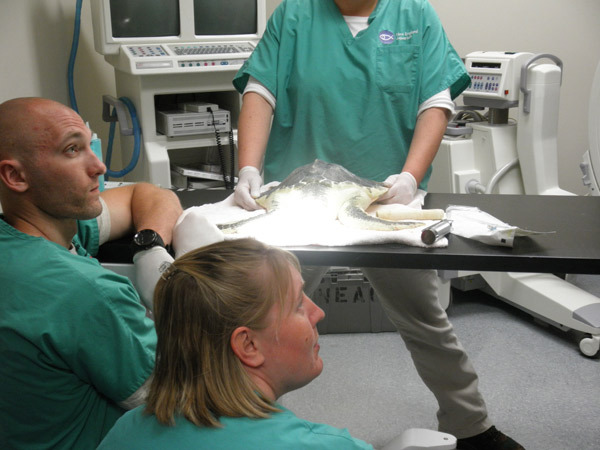 With 30,000 animals of more than 750 different species living at the Aquarium, it is challenging to meet all of their medical and diagnostic needs alone. 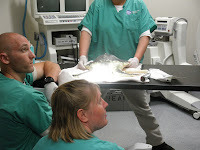 The Aquarium has a sophisticated veterinary operation and excellent medical facilities, but when it needs the services of specialists and the most high tech of diagnostic tools, it has been fortunate to be able to turn to the Massachusetts Veterinary Referral Hospital. For the past eight years, the Massachusetts Veterinary Referral Hospital has donated the services of their veterinarians and technicians in Woburn as well at their other location, the Bulger Animal Hospital in North Andover, donating close to $10,000 in free care just this past year, Innis said. Participating veterinarians are: Drs. Jennifer O. Brisson, Gena M. Silver, Mark T. Troxel, Tonya C. Bromblee, and Ruth M. Marrion, and they have expertise in ophthalmology, radiology, neurology and surgery. They can also run MRI and EMG tests. Massachusetts Veterinary Referral Hospital is a 24-hour emergency/critical care and specialty hospital dedicated to providing referring veterinarians and their clients with timely access to the most advanced specialists and emergency services available today. Its board-certified veterinary specialists and licensed practitioners provide a complete range of care in behavior, cardiology, dermatology, diagnostic imaging, emergency/critical care, internal medicine, neurology, ophthalmology, physical therapy and rehabilitation, and surgery. Mass Vet is equipped with state-of-the art surgical facilities and technologically advanced diagnostic capabilities, including on-site MRI, CT scan, fluoroscopy, digital radiography, ultrasonography, endoscopy, electrodiagnostics and in-house laboratory.